On occasion, we here at Plan Financial have been accused of being too pessimistic about the markets. This, I admit, is somewhat understandable. Our investment committee has viewed U.S. stocks as overvalued for a few years now. As a result, we have been slowly divesting our clients of what we consider an pricey assets. We have, conversely, been investing our client’s resources in other securities that are a bargain. But while all this is taking place, the U.S. stock market is doing its best to imitate a rocket powered by the Energizer Bunny. Some might complain that, in light of this never-ending bull market, our caution is getting in the way of larger gains. That concern is worthy of a response, which I hope to briefly provide now. So, are we always negative? Are we “perma-bears” as some might suggest? Well, the simple answer is no. Negativity is a two way street – at least in the financial world. Suggesting one area of the market is over-priced, and due for a significant correction, is not to imply negativity across the board. Pessimism can have geographical barriers. In fact, as experienced investors know, there are always opportunities to make money in an increasingly capitalized world. The fact that U.S. stocks are overvalued does not suggest that everything else is, too. There are several places in the world where prices are undervalued, you just have to look for them, well, outside the U.S.
Another consideration is one of time horizon. I often read financial analysis and, to my dismay, the author may never identify the time period he has in mind when we provides his expectations. Some analysts suggest huge upswings in the market, but limit their optimism to the next six months. Others are similarly optimistic about the next several years. Still others are very negative, but in either a short term or long-term context. Here at Plan Financial, we are always looking out over the next 5-10 years when allocating our client’s assets. At the end of that time frame, we expect U.S. stock, bond, and real estate prices to be essentially unchanged from their current levels, if not below. This relative pessimism, however, must be understood in light of global opportunities as well as short-term and long-term expectations. Over the short term (1-2 years) we are rather agnostic about the U.S. market. We certainly could see a significant – and abrupt – correction in the various U.S. markets. However, we could also see investor euphoria drive prices even higher. That is the thing to remember about short-term market movements: they are unpredictable. They are based largely on investor preferences which, although extremely optimistic right now, can change rather quickly in the event of bad or surprising news. Over the long term (20-30 years) we are optimistic that despite some inevitable social upheaval from unsustainable debt accumulation, the U.S. Economy will continue to grow and be a dominant player on the global scene. Every economist knows that one of the fundamental building blocks of a healthy economy is savings. Savings = Investment. When individuals save money, the money is lent out through the banking system to individuals who will innovate and improve productivity for everyone. Savings is absolutely crucial for a growing economy. Late in the growth phase of an economic cycle, the savings rate will often drop as individuals overextend themselves. This isn’t coincidental. It is precisely the lack of savings that dries up the opportunity for continued growth. The economy then becomes the Energizer Bunny without the Energizer part. Really, just a stuffed bunny. The business cycle, thus, begins its contraction phase. 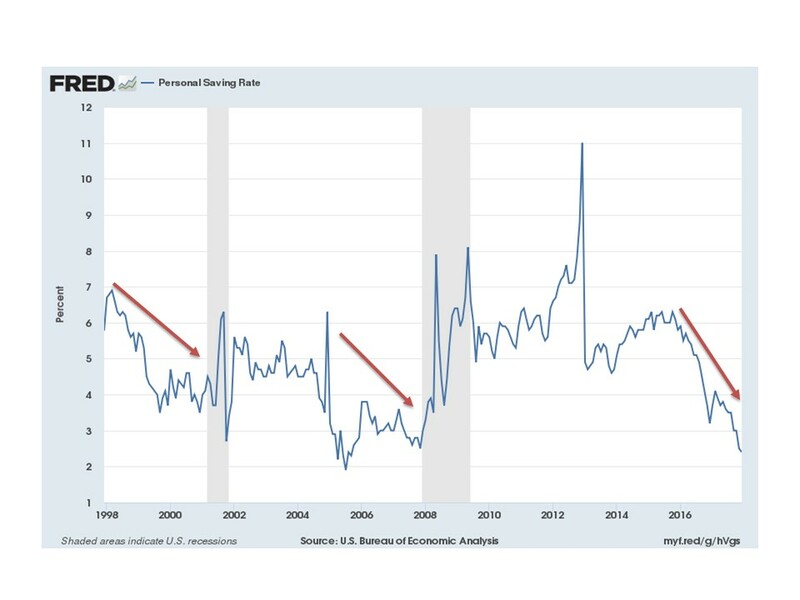 What the low savings rate tells us is that we are likely to see the end of this economic expansion sooner rather than later. There is another factor in play, however, that I am going to address in a follow up post. That factor is the impact of the federal reserve system in being able to mimic real savings in an economy. The actions of the federal reserve are equivalent to trying to power the Energizer Bunny with a cheap knock-off. It keeps going, and going, and going, until it crashes. Some people (otherwise known as central bankers and politicians) prefer this approach over against facing reality. However, as we were reminded by Jordan Peterson, those who have taken great pains to avoid the crash will not be able to tolerate it. Here at Plan Financial, we make no pretense about what is coming. What we are doing is preparing our clients to not only tolerate it, but benefit from it. Stay tuned.